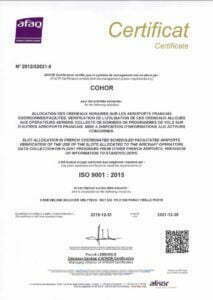 On October 26 th 2012, COHOR was certified by AFNOR, French representative at the international organization for standardization, according to the quality management standard ISO9001-2008. implementing all the organizational, procedural and human changes required by this international standard. What are the benefits of such a certification ? The quality management certification according to this international standard was identified as a way to ensure, through an audit conducted by an external organization independent from all interested parties, including the national authorities, that applicable European and French regulations are properly enforced by COHOR and that the procedures and processes established by COHOR and integrated in its Quality Management Manual are correctly applied. Without directly interfering in the way COHOR’s Managing Director and his team perform their duty, and therefore in full compliance with the independence principle required by the EU regulation, national authorities and COHOR’s members (airlines and airports) will then be alerted of any potential major deficiency of the French coordination thanks to the annual audit conducted by AFNOR, an internationally recognizedcertification organization. As a first step, COHOR identified and described the processes of its activity. Procedures were designed to specifically describe the implementation of every process key points. These procedures are purely for an internal usage, but they also allow the national authorities to check that they are compliant with all the applicable regulations. The correct implementation of these procedures is monitored and guaranteed by the certification. COHOR will organize every year a customer satisfaction survey. The objective of these surveys is to identify areas of progress or development but also to collect suggestions for improvement or service enhancements. Airline surveys will always be anonymous in order for them to freely answer. A consultant will then collect the answers for us. COHOR thanks in advance the airline representatives for their annual contribution, which is pivotal to the success of this quality management system, in order for COHOR to assess its quality level as experienced by its customers. A first airline satisfaction survey was conducted during the summer 2012. The results were posted on COHOR’s website. Several comments and suggestions made by our customers are already integrated in COHOR action plan for 2013. The Airport Managing bodies of French coordinated airports will also be interviewed shortly. On top of this, COHOR staff systematically captures every claim expressed by a customer, either by email or by any other mean. They also register every identified internal deficiency, in order to analyze it elaborate and implement corrective or preventive dedicated actions, which are evaluated later on for their efficiency. Finally, a generic email address qualite@cohor.org is now available for any organization concerned by COHOR’s services, airlines, airports, handling agents, national authorities, … to directly send comments, suggestions or possibly report claims. The certificate is obtained for a 3 years period, but an audit from AFNOR will confirm the certification every year. We thank all of our customers for their participation to our continuous improvement process.